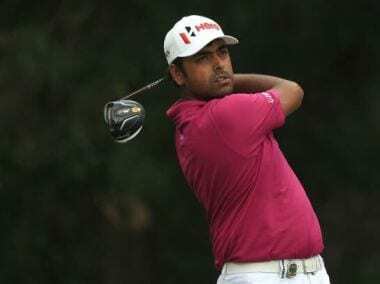 New Jersey: Anirban Lahiri will make his second appearance at the Presidents Cup after International captain Nick Price sprung a surprise by selecting the Indian as one of his two wildcard picks for the 28 September - 1 October event at Liberty National. Besides Lahiri, Price picked Emiliano Grillo of Argentina as the other wildcard for the International Team. On the other side, the United States captain, Steve Stricker picked veteran Phil Mickelson and Charley Hoffman. Two years ago, Lahiri became the first Indian to qualify for the International Team of Presidents Cup in Korea on the back of a brilliant season, when he won in Malaysia and Hero Indian Open in a matter of weeks. But he was left gutted after missing a crucial putt that cost the International team a vital half point. 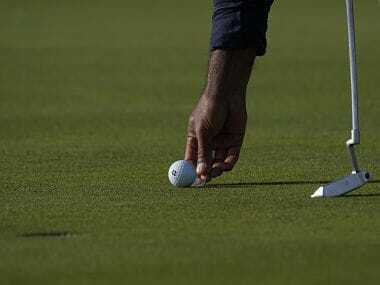 So, the Indian ace gets a chance to make amends as he created history by getting into the Presidents Cup a second time. Three weeks ago, Lahiri became the first Indian to play at the FedExCup Play-offs, but his form over the last few weeks has been way below his potential. Yet, he rode the great results at CIMB in October (T-3) last year and the runner-up finish at the Memorial, to seal his card and a place in Play-offs. Last week he also squeezed into the top-70 to make the third leg of the Play-offs in Chicago. Lahiri was over the moon at his selection. "Honestly, Nick (Price) has been great but I was not expecting it (to be picked). My last few events have not been great and I would have understood not being picked. "When Nick called last night, we (his wife Ipsa and he) were having dinner. I thought the call was to tell me 'Sorry, we are unable to have you on the team this time ...' - that kind of a call. But when he said, 'You are in'. I could not believe it. He had to repeat it." Lahiri added, "After the call was done, Ipsa and I kept staring at the food. It was just incredible – for him to have so much faith in me. He was so comforting last time around after the final hole in Korea in 2015." Lahiri said he has been waiting for an opportunity to redeem himself and would look to contribute to the team's success this year. "It's been two years waiting. Obviously I've been wanting to get back on team ever since that day in Korea. Since that day, I have personally felt I had some unfinished business," he said. "Obviously it's something that I feel that I need to do. I felt like I let the team down, and I feel like I need to go back out there and contribute to the winning cause. I feel like in the last two years, I've kind of grown as a player. "I've definitely learned a lot, after having moved here, played here, and I feel like I'm ready to go back out there and make a positive difference to the team." Talking of his two 'wildcard' choices, Price said, "Emiliano (Grillo) was unanimous before, basically, on Tuesday. Yesterday (Wednesday) when we had our conference call, his name came up first, and that was it. It was done and dusted. Price, while choosing Lahiri clearly opted for experience over another first-timer. Lahiri doesn't have a top-25 in his past seven starts, but as Price said, "He brings a lot to the team room. He's got a very positive personality. There were many reasons, but the big reason for us is he plays full time on the US tour. "Anirban, he brings an awful lot to the team. His camaraderie and spirit at the last Presidents Cup was something that we all took notice of. He was wonderful in the team room and very enthusiastic, and he's got a great heart," Price said. "Honestly, it didn't take us long to make the second decision, and probably one of the shortest conference calls I've ever been on in my life. That made it easy for me." Talking about giving a second chance to Lahiri, Price said, "I think it's really important. You know, I spoke to him after that match on Sunday (in 2015) – obviously he was a little shell shocked. "But I remember putting an arm around him and looked him square in the eye and said, 'You're never going to feel pressure like that ever again.' But I think he rose to the occasion. He hit a really good putt. He just misread it, and I think most of us knew that. "But you know, the emotion, you need that emotion. You've got to learn to lose before you really appreciate how to win. And I think we got so close last year, and that certainly has fueled the desire amongst these 12 guys," he added. Though the Americans narrowly captured the 2015 Presidents Cup to push their record in the event to 9-1-1, they've won the last four home matches by at least three points.